Solid wood cabinets and cupboards by Sawdust City are made in Eau Claire, Wisconsin! 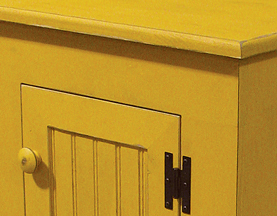 We offer many terrific wood cupboards and cabinets: jelly cupboards, pie safes, country wood cabinets, and more! Choose the paint and finish to fit your décor. We offer top cupboards that coordinate with jelly cabinets to make a larger, complete hutch, and all of our wood cabinets make great storage furniture! Find the perfect space in your kitchen, bathroom, entryway, or use these solid wood cabinets as night stands, end tables, and country-styled storage furniture! If you don't see exactly what you are looking for, we can custom make to order!